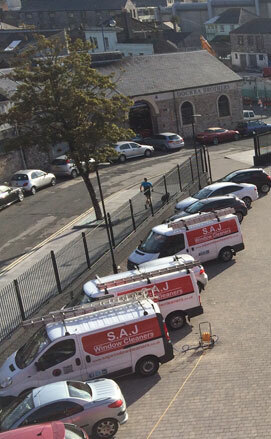 S.A.J Window Cleaners services a large number of different commercial properties in Exeter, including shops, offices, schools, hotels and hospitals. The S.A.J Window Commercial Window Cleaning team is fully trained and equipped to safely clean your commercial property anywhere in Exeter and Surrounding areas, regardless of its size. We send the team that's right for your building. Your Commercial Window Cleaning in Exeter may require poles and ladders or our specialized Water Fed Pole Pure Water cleaning equipment to reach inaccessible windows. Health and Safety Compliant S.A.J Window Cleaners will prepare a risk assessment in accordance with current statutory requirements. S.A.J Window Cleaners staff are fully insured for Public Liability and Employers liability insurance. Flexible and Adaptable S.A.J Commercial Window Cleaners in Exeter offers a wide range of frequencies to meet with your requirements Daily, Weekly, Monthly, Bi Monthly, 3 Monthly, 6 Monthly, Yearly or One-Offs Special Cleans. Competitive Pricing Free Site Visit and Quotation. We carry out site visits to discuss the specification and answer any questions. Regardless of the size or frequency of the job we will provide a free quotation. Exeter Commercial Window Cleaning and More!! We clean many of shop fronts each week with 'shop runs' in most of Plymouth. These shops are cleaned on a weekly, fortnightly or monthly schedule to ensure customers see their business at its very best. Where possible, shops are cleaned before opening hours so as not to inconvenience you or your customers. We also clean many shops that are not part of a 'shop run' but in stand-alone locations. The exterior of your shop or business is the first visual impression for your existing and potential customers. It is important that you are able to give a good and lasting impression every time your premisis is looked at as this creates a general good feeling towards your business The exterior of your busines is a 24/7 advertisement for your company, and therefore it is important to maintain high standards of your whole of your exterior including your sign. Do you have external cladding on your shop, Retail Park, industrial unit or warehouse? Building cladding can quickly become covered in grime and dirt through general day to day activities. Dirty and unsightly external cladding can ruin the look of your operation, but we can help. Our cladding cleaning services will make your cladding look like new. S.A.J Window Cleaners Ltd can keep your cladding and facias gleaming and keep disruption to your business to a minimum. We can work whatever hour suits your needs the best, whether weekends, evenings or both! S.A.J Window Cleaners also offer a Perspex/glass roof cleaning for the commercial sector. This type of cleaning is a little more involved than just window cleaning and requires specialist techniques and equipment to carry it out correctly and safely. Whatever debris collects in your gutters, will get washed into your downpipes and drains. This equates to about 70% of blockages that occur. If you are unlucky enough to get a blockage in your downpipe or even worse your drain, rainwater will not be able to drain away from your property as intended and will find another way to escape. Water will always find the lowest point of the gutter before it cascades over, potentially creating a number of further problems such as penetrating damp.